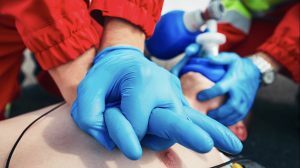 This unit describes the skills and knowledge required to use specialised equipment in the provision of resuscitation in line with the Australian Resuscitation Council (ARC) guidelines. Provide Advanced Resuscitation applies to a range of industries where first aiders need to be trained in the use of defibrillators and medical oxygen. This unit applies to workers who may be required to use specialised equipment to provide resuscitation in a range of complex situations, including community and workplace settings. It is relevant for designated first aiders working in manufacturing, construction, mining or any occupation involving hazardous work. The knowledge and skills will enable you to sustain life and minimize the consequences until professional help arrives. It is recommended this unit be renewed every year in line with the Code of Practice standards. $110.00 per participant. Call us on 0416 888 343 for group bookings.